Attention dog lovers! Since our first event was so successful, we decided to do Pups and Pints 2! We now welcome PittieLove Rescue, Inc. to our taproom to spread awareness about one of the most misunderstood dog breeds. PittieLove Rescue is an all-volunteer, foster-home-based rescue dedicated to the care, understanding, and adoption of the American Pit Bull Terrier. PittieLove’s primary goal is to ensure that our rescued dogs will never again suffer from abuse or neglect. 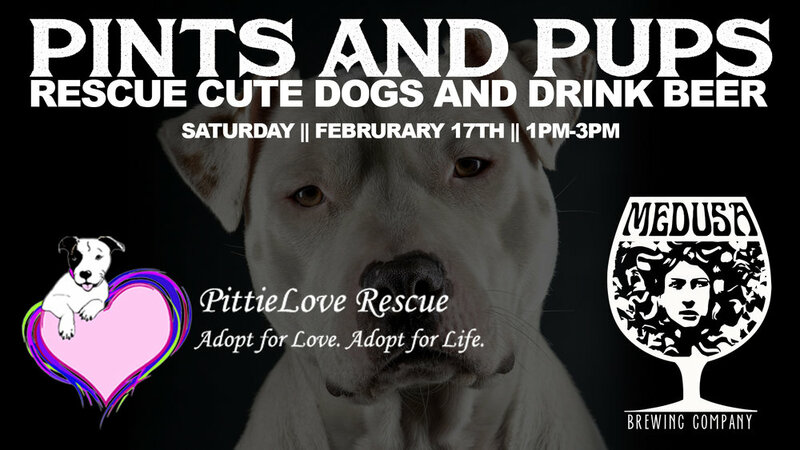 Come talk to some volunteers from PittieLove Rescue in our taproom Saturday, February 17th, from 1:00-3:00 PM, and learn how YOU can save a dog's life today. You can even meet an adoptable dog! If at this time you are unable to foster or adopt a dog, you can still help out! Bring in any toys, treats, leashes, and collars, or you can even make a donation! PLEASE NOTE: This is a special event and that we still are unable to invite outside dogs into our taproom. Thanks for understanding!